Upstairs in the Museum, Calendar Hall was created to provide fast facts and information using a graphic representation of events as they occurred over time. The sequence presented is designed to tell a story of the past, present, and future of Clinton County, of Michigan, and of the United States. The panels, containing articles and pictures portrayed on boards in a linear fashion, show that time proceeds in a straight line as unique events in history occur. While enjoying a fast “snapshot” of time, people, and events, the Calendar Hall allows guests to view them in sequence, and understand how each impacts the next. 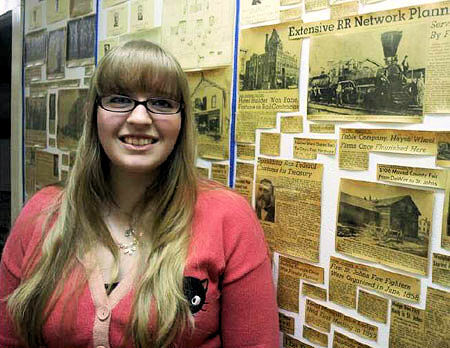 Over the last year, volunteers at PGS have been working to recreate the Calendar Hall exhibit. Kevin Kacel, a history teacher at Waverly Middle School, has taken HD photos of all the articles and pictures in “The Hall”, and made digital files of each panel. Chelsea VanSipe, a Graphic Designer, has been “cleaning-up” the articles and photos so that new panels can be printed and installed along the hallway. Museum staff hopes to paint the hallway before the installation of the new panels. Also on the wish list for The Hall are some new lights to brighten up the panels and make them easier to see and enjoy. Private donations have helped with the costs of this large project, but there is still a need for more funding and volunteers to help with the work. If you are interested in being part of this project in any capacity, please contact the museum at (989) 224-2894 or PGSMuseum@hotmail.com. Wallace Watt was one of the first boy scouts in America. He was one of the founding members of Troop 1 in Barre, Vermont. He moved to Michigan from Barre and was the oldest boy scout in American when he died. In his hometown of Barre, Vermont we are in the process of erecting a granite monument in honor of the members of Troop 1. We have a website which details our progress, and we would like to hear from anyone who knew and worked with Dr. Wallace Watt. We are also seeking donors, who would like to contribute to this project, and I thought someone may know how to contact the Kellogg family in regard to this.